Nissan Motor Co. said Tuesday that it planned to accelerate the penetration of internet-connected vehicles by offering a connection device to existing customers in Japan and India starting next year. Nissan has been among the most aggressive car makers in putting connection technology in lower-priced vehicles. Now, it is expanding the offering to owners of older models. The device will allow car owners to get live updates on maintenance needs, make service appointments and order parts ahead of time. Nissan said it planned to bring the device to other countries eventually and install it in 30% of the 40 million Nissan vehicles on the road globally today. The device contains a Global Positioning System tracker and can transmit information about the vehicle’s health to Nissan through mobile networks. The goal is to give customers a taste of connected-car services that will become available on new cars, Nissan said. “In the coming years, customers will see sophisticated applications of software and hardware that will keep them connected with work, with friends and family. It will allow them to control their vehicles from their phones in their pockets,” said Kent O’Hara, who runs Nissan’s after-sales division. Fresh from the sale of their first venture focused on the heating, ventilation and air conditioning (HVAC) market, Shishir Gupta, Nithin David and Varun Gupta embarked on what they thought was their next breakthrough idea. In mid-2013, the trio decided to devise solar air conditioners based on their previous experience in the market but, after some pilots, they discovered the idea was commercially unviable. From the ashes of their second enterprise, they did manage one small gain — a connected controller that reduced energy use by 30% during the night. Using this, they pushed their entrepreneurial energy in a new direction — towards the rapidly emerging opportunity in the internet of things (IoT) , or devices and objects that send and receive data over the internet. Rather than build large systems for this, their new venture Oakter is thinking much smaller. It is building out a series of IoT-based devices to “smarten” homes across India. In around two years of operation, Oakter’s controllers have smartened some 10,000 gadgets, claims Shishir Gupta, without disclosing the number of homes his controllers have been installed in currently. The startup’s full launch hasn’t even happened, he says, since it is still reaching out informally to consumers. Around Diwali this year, Oakter is expected to make a big-bang offline launch and expects to reach 10,000 homes in a year and revenues of Rs 100 crore by 2018-19. “Within 10 years, IoT will transform the way we manage our lives,” says Shishir. There are plenty of data points to back his enthusiasm. In 2008 itself, there were more objects connected to the internet than people, and technology researcher Gartner forecasts that by 2020 there will be nearly 21 billion connected devices. If the ATM was perhaps the first popular connected device in the early 1970s, hundreds of companies have since shown an interest in getting wired up. In the US, the largest technology market, there has been a mixed response to various kinds of IoT. According to CB Insights, a tracker of this kind of deal data, deal volume is on track to surpass 2015’s total by 30%. Fundingwise, 2016 should be a robust year for IoT in the West, and the second year in a row of $1.2 billion-plus in funding. Several startups in the field raised significant amount of funding, including IoT software and services company Greenwave Systems ($45 million Series C), commercial drone developer Airware ($30 million Series C), and connected HVAC and lighting company Enlighted ($25 million Series D financing).However, deal flow looked less upbeat on a quarterly basis, with both value and volume declining in the second quarter of 2016. After an increase in the first quarter with 54 transactions, deal-making fell 26% quarter-over-quarter. And funding fell from $328 million to $325 million — a 9% quarter-on-quarter decline. At a global level, there is massive potential. According to a statement from Gartner’s research chief Peter Sondergaard, the incremental revenue generated by IoT suppliers is estimated to reach $309 billion per year by 2020. This growth opens up new business opportunities, as half will be attributed to new startups and 80% will be in services, not products. Manufacturing, healthcare and insurance are expected to lead the IoT race. Some of this entrepreneurial interest is being generated in India, too. For example, in May this year, Entrepreneurship and Venture Capital (EVC), an early stage investor, launched a $50 million unit to focus on IT. Qualcomm Ventures, the VC arm of the global chipmaker, recently unveiled its $150 million India fund and made its first investment of $10 million in healthcare IoT venture Attune Technologies. In early July, a centre of excellence for IoT was launched jointly by software industry lobby Nasscom, the department of electronics and information technology and the Education and Research Network. This centre can house up to 40 startups and the model is expected to be replicated nationwide. China will reduce the amount of coal burned directly in industrial furnaces and residential heating systems in order to tackle a major source of smog, the country’s energy regulator said on Wednesday. The National Energy Administration (NEA) said in a joint announcement with other government bodies that around 700 million to 800 million tonnes of coal is burned directly in China every year, much of it in the countryside, where access to electricity is limited. Directly burned coal amounts to about 20 percent of China’s total coal consumption volume, much higher than the 5 percent rate in Europe and the United States. China will aim to replace direct burning with electricity, including renewable power as well as ultra-low emission coal-fired generators, the NEA said. 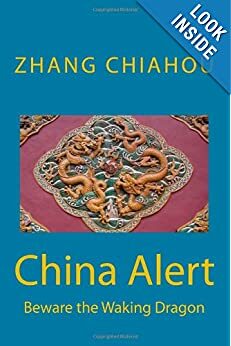 China currently relies on coal for around 64 percent of its total primary energy needs and for three-quarters of its total power generation. Emissions from the direct combustion of coal are around five times higher than those from coal-fired power plants, which are subject to strict anti-pollution regulations. During the 2016-2020 period, China plans to raise electricity’s share of the country’s overall energy mix to 27 percent, up about 1.5 percentage points from now and raising total power consumption by around 450 billion kilowatt-hours a year, the NEA said. Experts have estimated that China will need an additional 600 GW of coal-fired power capacity over the 2015-2030 period in order to replace direct coal combustion. Chinese police attributed 80,200 traffic accidents in 2013 to road rage, and the number rose by 2.4% in 2014. Men account for 97% of road rage incidents, official data show. China is a notoriously dangerous place for driving in general. The World Health Organization has estimated that 261,000 people died on China’s roads in 2013. Chinese government data show that last year 1,895 people died in traffic accidents when crossing roads, and 4,180 people died between 2011 and 2014 on public buses that were speeding or overloaded. Yet when it comes to the surge in road rage, experts point to a range of possible explanations. One is that the rapid development of China’s car market has led the country’s roads to become increasingly crowded, creating frustration and anger on the streets. Sociologists also link road rage to general anxiety and fickleness, one of the side products of China’s rapid economic growth — and its accompanying social pressure — over the past three decades. In China, the total number of vehicles has increased by more than 18 million cars for each of the past five years. As of the end of October, China had 169 million autos, according to Ministry of Public Security statistics, next only to the U.S.’s 240 million. The number of license-holders has risen even more quickly; since 2010, China has added more than 20 million new drivers each year. Now one in five Chinese has a license. The country’s infrastructure has struggled to keep up. Data from the Ministry of Public Security show that 35 Chinese cities now have more than one million automobiles. Ten of those cities — including Beijing, Chengdu and Shenzhen – each have more than two million cars on the road. But while the number of China’s motor vehicles and drivers has each risen more than 20-fold since 1987, the country’s road capacity has increased only 3.4 times over the same period. The rash of new drivers is also posing safety hazards. The official Xinhua News Agency cited a spokesman from the Ministry of Public Security as saying that drivers with less than one year of experience play a large role in traffic accidents. To be sure, China has some safety regulations in place. For example, drivers and front-seat passengers are required to wear seatbelts, and the use of mobile phones while driving is prohibited. But these laws are often ignored in practice. Distracted driving – operating a vehicle while texting, talking on the phone, watching videos, eating or reading – contributed to more than a third of fatal traffic accidents in 2014, causing 21,570 deaths, the Ministry of Public Security said. Chinese authorities are working to counter the trend. In the past month, the Ministry of Public Security launched a public education campaign on road etiquette after several high-profile cases of road rage violence this year. It advocated against dangerous driving behaviors including street racing, drunk driving, aggressive driving and blocking emergency lanes. 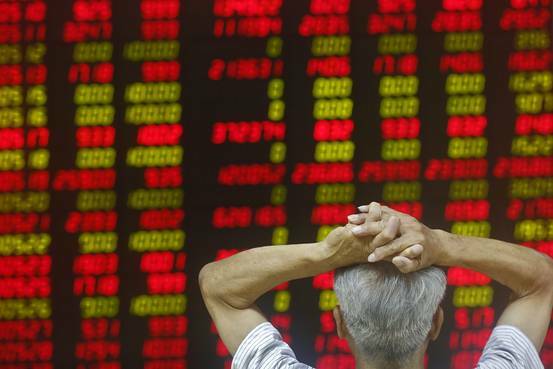 The dive in Chinese markets on Wednesday may have rattled investors across the globe, but prospectors in India need not panic: any trickle down impact of the crisis on the South Asian nation will be limited to certain sectors. The Shanghai Composite index has lost around a third of its value over the past month and concern is growing that Beijing’s failure to prop up its equity markets means it will be unable to push through its broader agenda of liberalizing the economy to mitigate the country’s slowing growth. India’s metals companies are likely to be affected the most as China is the world’s biggest importer of steel and iron ore. Any further slowdown in China’s economy will bring down global prices, hurting Indian firms’ profitability. Meanwhile, luxury-car manufacturers are also likely to take a hit. Tata Motors 500570.BY +1.62%’ share price has already lost about 8% in the past two trading sessions on concerns that the problems in China could further worsen the slowdown in demand for its Jaguar Land Rover luxury cars there, which is now the single-largest market for JLR. But long-term effects are expected to be minimal. India’s benchmark S&P BSE Sensex index has gained about 5% during the past month. Though India’s benchmark index fell 1.7% yesterday, analysts and fund managers attribute it to a domino effect from China that won’t last. India’s improving domestic fundamentals are capable of thwarting a similar meltdown. “India is relatively better off among the emerging markets as we don’t have too many negatives compared to other countries,” said Deven Choksey, managing director of Mumbai-based brokerage K.R. Choksey Shares and Securities. He said investors will give preference to the ongoing reform process in India and key legislation such as the Land Acquisition Bill and the Goods and Services Tax Bill, rather than global events. Analysts said upcoming corporate earnings will also matter more to Indian stock prices than the Chinese turmoil. Though corporate earnings are expected to take some time to improve, analysts are confident that a sharp recovery in profits is likely from the second half of this financial year. The January-March period was the worst earnings season in the past two years. “Both (China and India) can’t be compared and, in fact, the developments in China will only serve to reinforce confidence in India and India’s market structure,” said Aashish Somaiyaa, chief executive of Motilal Oswal Asset Management Co. In fact, foreign investors, who own about 43% of the publicly-traded shares of companies in the Sensex, have invested about $600 million already in July, after pulling out nearly $1.8 billion in the previous two months. And domestic investors have not lost faith in the Indian story as they have poured in nearly $2.4 billion into stocks since May. “Whenever there is a correction in [the] Indian market, we are getting more enquiries,” said Nandkumar Surti, chief executive of J.P. Morgan Asset Management India Pvt. 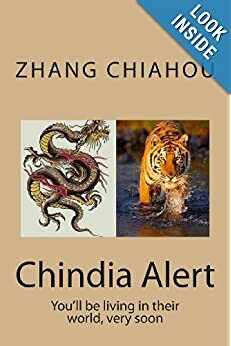 Ltd.
via How India Could Be Hit by Chinese Stock Slide – India Real Time – WSJ. Renault S.A. unveiled on Wednesday an affordable small car in India as it seeks to expand its foothold in this growing automobile market. Named Kwid, the car would have a 0.8 liter gasoline engine and go on sale during the festival season that starts around September, Carlos Ghosn, Renault’s chief executive, said after its unveiling. It would be priced between 300,000 rupees ($4,710) and 400,000 rupees ($6,280). “The Kwid will be a big contributor to Renault’s growth in India followed by emerging markets and other parts of the world,” Mr. Ghosn said. The company is aiming to increase its market share in India to 5% from the current 1.5%, he added, without elaborating by when it hopes to do so. 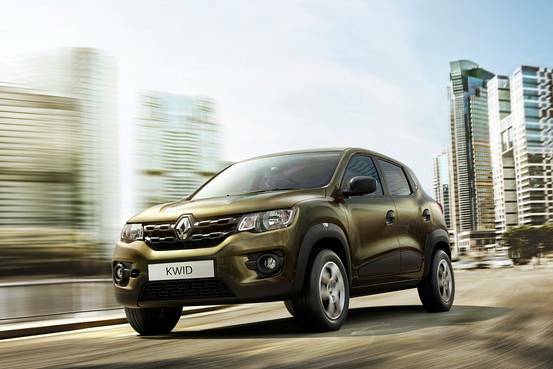 via Renault Unveils Its Cheapest New Car in India, the Kwid – India Real Time – WSJ. Foreign automakers continue to plough money into factories in China, the world’s largest car market, even as the biggest economic slowdown in a quarter of a century crimps sales growth. Market leaders Volkswagen AG (VOWG_p.DE) and General Motors (GM.N) show no sign of letting up on their planned investments, while Toyota Motor (7203.T) and Ford Motor (F.N) are also pursuing new China expansion plans. That’s in spite of the economic slowdown further depressing the car market in January-March, when sales grew only 3.9 percent, compared to 9.2 percent a year ago and way below the 7 percent growth that the China Association of Automobile Manufacturers (CAAM) predicts for this year. via Foreign automakers double down on China bets despite slowing growth | Reuters. China completed the building of 5.11 million affordable houses in urban areas in 2014, with 2.29 million such projects under way, surpassing the goals set at the beginning of the year, the State Council announced at a press briefing on Friday. The central government granted 198 billion yuan (32.35 billion U.S. dollars) to fund urban affordable housing projects in 2014, an increase of 25.1 billion yuan from the previous year, according to Qi Ji, deputy head of the Ministry of Housing and Urban-rural Development. Throughout the past four years, more than 20 million affordable houses were completed, with 12 million under construction, and the assistance fund for building the houses has reached 710 billion yuan, according to Qi. China has set goals to construct 36 million affordable houses, also called state-subsidized housing, public housing, or social housing, between the start of 2011 and the end of 2015. “This year is the final year of the Twelfth Five-Year plan (2011-2015), and the government will accelerate the affordable housing project with a focus on transforming the shanty towns,” Qi said. The Chinese government has been rolling out an affordable housing scheme since 2007, in an effort to provide homes to people unable to buy them at market prices. The efforts are also aimed at helping counter the slowdown in the property market in recent years. via China surpasses affordable houses targets – Xinhua | English.news.cn. 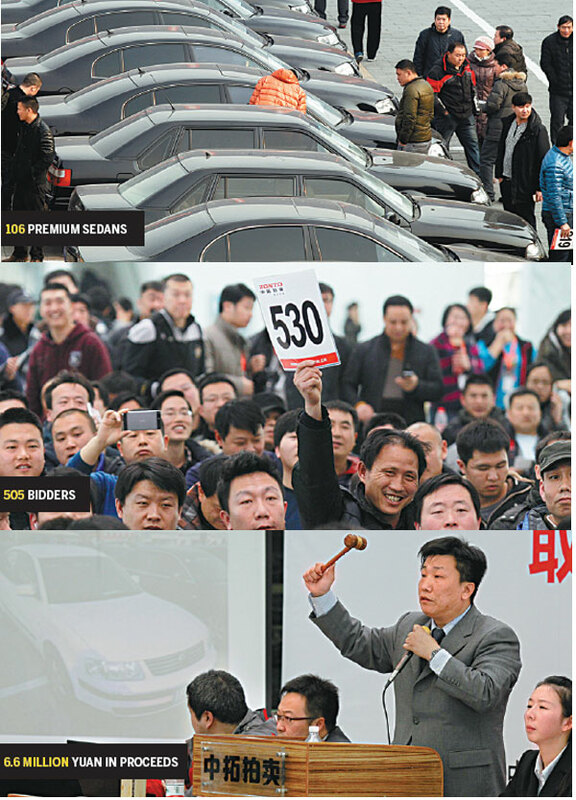 The first group of premium government automobiles to be auctioned off amid the ongoing frugality campaign have gone under the hammer in Beijing. According to Zonto Auction, the 106 vehicles it sold on Sunday were from six central government departments including the China Insurance Regulatory Commission, China Securities Regulatory Commission and State Bureau for Letters and Calls. The cars were without plates, which would have to be supplied by the purchasers. A total of 505 bidders from around the country joined the auction, which brought in proceeds of 6.6 million yuan ($980,000). The highest bid went to a Toyota cross country vehicle for 200,000 yuan. Li Guanwen, 40, of Hebei province, bought a Skoda bus for 160,000 yuan. “The market value of this bus is around 500,000 yuan,” said Li. In November 2013, public agencies were told to cut their vehicle fleets, as well as reduce receptions and overseas trips. The use of all vehicles, except those required for law enforcement, emergency duties and essential public services, were scrapped or severely reduced. via Govt sells off premium cars- Chinadaily.com.cn. F.N) and Hyundai Motor Co (005380.KS) will showcase compact sedans at India\’s largest auto show this week, targeting what they think could be the next hot market in a country long dominated by ultra-cheap hatchbacks. Global carmakers are still banking on emerging economies including India, the world\’s sixth biggest auto market by volume, to drive long-term growth despite a recent slowing in demand. Industry-wide sales in India are headed for a second straight annual decline in the fiscal year that ends in March. Hyundai, the biggest foreign carmaker in India, will next month roll out its Xcent compact sedan, which is under four meters and thus taxed less heavily than longer cars in India, executives said at the car\’s global unveiling on Tuesday. The car will be on display at this week\’s auto show in the outskirts of New Delhi, which opens to the public on Friday. via Global carmakers see small sedans as next hot market in India | Reuters.